75th wedding anniversary can be another diamond anniversary. Why diamonds? Like the song says they are “Forever” this does not mean you have to buy diamond jewellery for gifts. A couple that has been together for 75 years most likely is not interested in material things. Rather than giving diamond rings or necklaces, a gift of time or companionship may be more appropriate. Seventy-five years of marriage is an achievement both in love and health. It is likely that there will be many grandchildren and probably great-grandchildren and beyond by this time. The best gift you can give the anniversary couple would be a family party with their favourite meal and comfortable chairs that make them feel special, secure, and central to the room and conversation. Greetings can be from Queen Elizabeth II by informing Buckingham Palace of the coming anniversary. 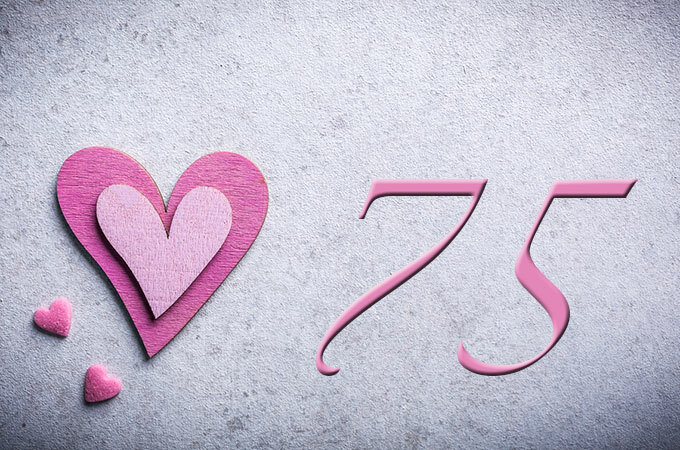 There are many great ways to celebrate a 75th wedding anniversary. Spending some time with a couple to mark this occasion certainly is a nice and thoughtful gift in itself. Most couples celebrating this anniversary will be in their 90’s. Travel may be a challenge for the couple so get together with other family members and give some thought about planning this milestone celebration. Have it at your home and decorate the house or a table with diamond white flowers, roses are a very popular choice and available most of the year. It doesn’t have to be a big party, instead you might like to host an afternoon tea, or even arrange for a family picnic in a park. Family will know of the couples interest and likes, they may have old film or video footage and photos of previous parties and events that was attended by the couple and these put together in a presentation DVD or scrapbook to be enjoyed at their leisure. Happy 75th wedding anniversary and welcome to a very exclusive club. Congratulations on your beautiful marriage! We are celebrating 46 next month….what a blessing to be married to our best friend! My parents are celebrating their 75th wedding anniversary on April 1 ! !